New Orleans is a place where parties “just happen” all the time, but the truly great events take a little planning. For an epic gathering everyone will be talking about for years to come, follow these easy steps. Step 1: Nail down your finances. Set your budget early and stick to it. If you are planning your party with someone else, agree on the boundaries ahead of time. Pulling out all the stops might be fun now but it won’t be fun when the bills come in. Step 2: Decide on a day and time. Pick a day when people will most likely be available. In New Orleans, avoid days when there’s already a lot going on in the city unless your party is somehow a part of that event. If your party is going to be around a major holiday or a 3-day weekend, make sure your friends are going to be in town to avoid disappointment all around. Step 3: Choose your venue. Where you have the party will set the tone for the evening and, of course, determine how many people you invite. In the New Orleans area, ask yourself: Do you want to be in the French Quarter? Plantation country? On a swamp boat? Do you want a venue with a courtyard or balcony? Do you want someplace fun and funky, modern and casual, or old-world elegant? Of course, the time of year and reason for the event will influence your choice. Peruse these venues. Step 4: Pick a theme and choose your decorations. Will your theme be Mardi Gras? A Cajun fais do do? Storyville? New Orleans music? Halloween? Christmas? Head to Pinterest for inspiration. Do you need to buy everyone boas? Need some cardboard French Quarter lampposts? Some second-line umbrellas? What kinds of flowers or centerpieces are appropriate? Do you need to create and name a signature drink? Once you’ve decided on a theme, make sure your guests know the specifics well in advance so they don’t show up in a cocktail dress to a barbecue. Step 5: Send out your invitations. After making your guest list, make or buy invitations or go green with email invitations. A wedding invitation should go out two months ahead of time, while a birthday party may only need two-week’s notice (unless it’s holiday time). Make sure the invitation includes information on how to dress, where to park, and where to RSVP. And be creative! The anticipation should start the minute they open the envelope! Step 6: Make food a priority (it’s New Orleans, after all). Unless you plan on doing all the cooking yourself or making it a potluck, it’s time to choose your caterer. 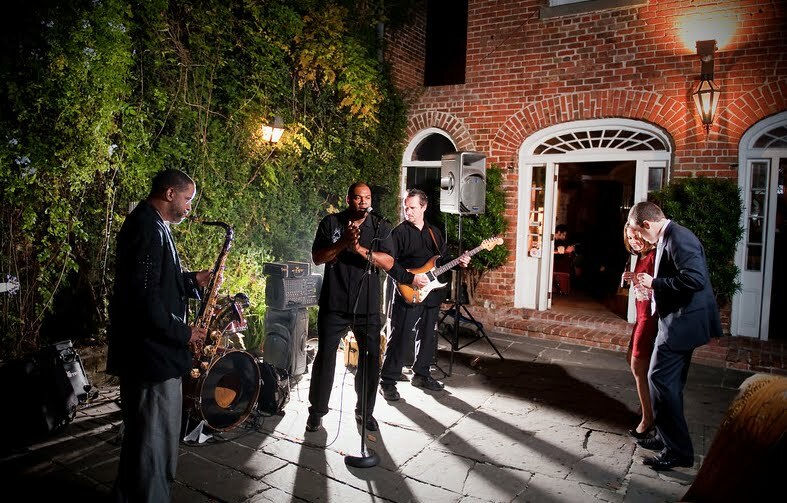 Many great New Orleans Restaurants offer on-site and off-site catering for parties. If you hire a catering company, they can supply dishes, tables, chairs and linens; décor, entertainment, servers, bartenders – even valet parking. And all kinds of food and drink is available for everything from a crawfish boil to a cocktail party with hors d’oeuvres to a fancy sit-down dinner. View our favorite catering companies. Step 7: Hire the band, a DJ or make a playlist. In New Orleans, music is almost as important as the food. We have a lot of great local bands of all types and some really fun DJs to choose from. Do you want people to dance? Make sure you choose a venue that can accommodate that. Just don’t underestimate the importance of a fantastic soundtrack. Here are some entertainment ideas. Step 8: What about gift bags? Guests always appreciate a little parting gift. It might be edible or something that will last longer and serve as a souvenir of the evening. Don’t feel you have to overdo it. Here are some companies that can help with gift ideas. Step 9: Designate or hire a photographer. Make sure you’re able to relive your party by designating a friend or relative you trust to take lots of photos or, better yet, hire a professional photographer or videographer. A lot of work goes into throwing a great party – capture those memories! Step 10: Hire a designated driver for you and your guests. Partying and driving don’t mix. New Orleans is full of great companies who will both get your guests to the venue (eliminating parking woes) and get them home safely. View Transporation Options. Step 11: Be a guest at your own party. If the happiest you are all day long is when the last guest leaves, you’ve failed. Don’t make this all work. Take time to eat, dance and engage in idle chatter. The best hosts aren’t just gracious – they know how to have fun!